Tooth Extractions: Who Do You Need to See for Advice? Tooth Extractions: Who Do You Need to See? It can be tough to know if tooth extractions are necessary. How can you determine if you need a tooth removed and whose advice should you seek out? Understanding the answers to these questions can put your mind at ease and ensure you are taking the best course of action. The most common reason a tooth requires removal is if it’s too decayed for a dentist to repair. Cavities, in particular, can lead to damage beyond repair. The early symptoms often include pain, discomfort, and sensitivity to temperature. The longer you prolong the treatment of a cavity, the worse the symptoms can get. Longer-term symptoms include acute pain, unsightly stains, bad breath and an increased risk of infection. Eventually, when bacteria spreads to the tooth’s pulp, a cavity becomes untreatable. A loose or broken tooth is another frequent issue. Trauma during high-impact sports or eating hard foods could damage your teeth. Minor chips and fractures include craze lines and fractured cusps. These are both surface-level damages to a tooth. Dentists can treat these by reattaching the broken piece or using tooth-colored filling. If the crack exposes the tooth’s pulp, irritation can develop to the point where the pulp cannot heal itself. This type of irritation typically occurs with split teeth and vertical root fractures. These are cracks that affect the root of the tooth. An irritated pulp often develops into an infection if left untreated for too long. Periodontal disease can also cause a loose tooth. When you leave a cavity untreated, sooner or later the gums become infected, which is called Gingivitis. Early warning signs include swollen gums or gums that bleed when you brush your teeth. Periodontal disease occurs if the infection spreads to the supporting tissue. Inflamed tissues and destroyed periodontal ligaments can fail to hold the tooth securely in place. Often, removing the tooth is the only way to prevent further complications. Another common problem that requires extraction of a tooth is if it’s in the way of your other teeth. Occasionally, baby teeth don’t fall out to make room for your permanent teeth to come in. In early adulthood, wisdom teeth can have issues growing in normally as well. Sometimes an orthodontist may recommend a tooth extraction before braces are applied. Otherwise, your teeth could be too big for your mouth when properly aligned. In each of these cases, tooth extractions will help to avoid the discomfort associated with crowded teeth. If teeth do become crowded, you run the risk of an impacted tooth, which means the tooth lodges itself into the jaw or bone. Hence, an impacted tooth is a surefire way to irritate the gums. A weakened immune system could also cause issues requiring tooth extractions. Drugs related to organ transplants or chemotherapy for cancer patients often lowers the ability of the immune system to fight infections. There is a higher chance of a tooth becoming infected and spreading to the rest of your teeth with a weakened immune system. In some cases, the infection could even enter your bloodstream and lead to more serious, life-threatening issues. Periodontal disease is particularly concerning because it’s linked to heart disease, stroke, diabetes, and respiratory disease. As a result, dentists strongly recommend tooth extractions as a precaution. Thus, it is important to understand that oral infections can cause systemic issues within your body in the long-term. Who Should You See for Tooth Extractions? If you are experiencing any of the previous symptoms, it’s a good idea to visit a dentist first. First, most dentists will take an X-ray to get a better understanding of the problem area. Then they will develop a treatment plan. In many cases, the dentist will treat it by using a crown or filling. The dentist may be able to perform tooth extractions right in the office for situations that are untreatable. If the dentist is unable to treat the tooth, they may refer you to an oral surgeon. 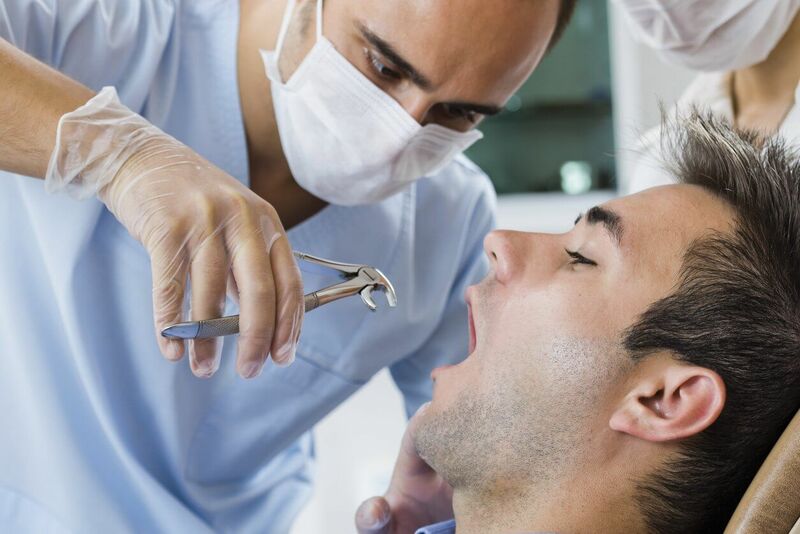 Oral surgeons can handle more complex tooth extractions. These situations include impacted teeth or wisdom teeth with fully developed roots that require cutting through tissue and bone. Take a look here to get a better idea of why an oral surgeon could be necessary. In the end, if you have any pain or discomfort there is a chance you will need to have a tooth extracted. It is best to consult a dentist first to see if they can save your natural tooth. If not, they may have the ability to remove your tooth with minimal surgical involvement. An oral surgeon is only necessary for more intensive tooth extractions. Often, dentists and oral surgeons choose to extract a tooth to prevent issues in the future. The last thing you want to do is leave a tooth untreated and have further health problems down the line.